Credit: S. Schnee, et al. ; B. Saxton, B. Kent (NRAO/AUI/NSF). 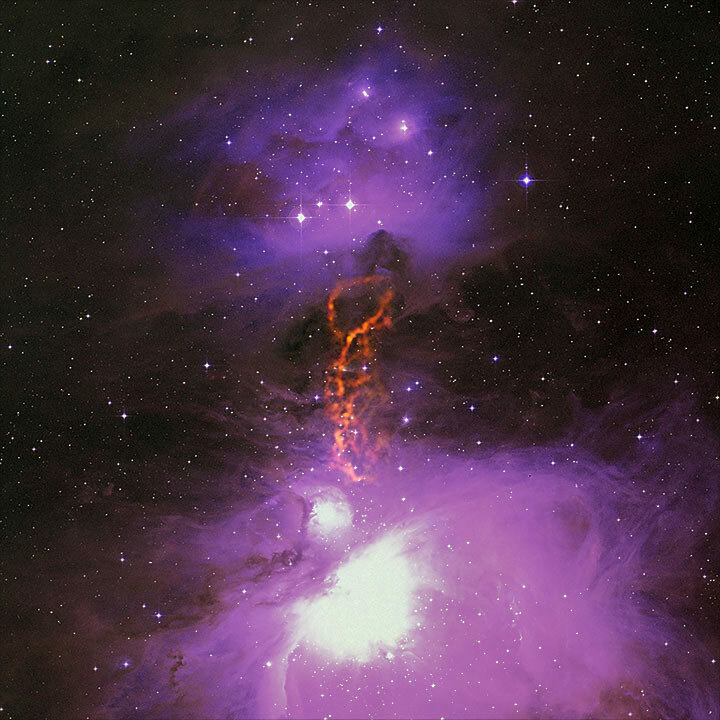 This image, which was taken using the Green Bank Telescope (in West Virginia), showcases the complexities of the Great Orion nebula. Astronomers have long known that this stellar nursery is home to many peculiar features, which include “ribbons” of gas and evidence of a black hole lurking in the shadows. Now, astronomers captured the best image yet of one little know filamentary region within the nebula; a place pervaded by cool dust that’s just a few degrees above absolute zero. If proven true, the material comprising this filament could be immeasurably important to our planetary formation models, which say that planets slowly coalesce over time; the process beginning when microscopic particles gradually build up to a sizable quantity. Then, larger pieces collide and merge. Introducing larger pebbles to the picture would reduce the time it’s expected to take for planets to take shape.